Einstein, who became an American citizen in 1940, worked actively to help individual scientists, artists, and intellectuals endangered in Nazi Europe to enter the United States. Because the German state had accused many of these people of being Communists, Einstein’s intercession was seen as a suspicious practice, and earned mention in the scientist’s extensive FBI file. 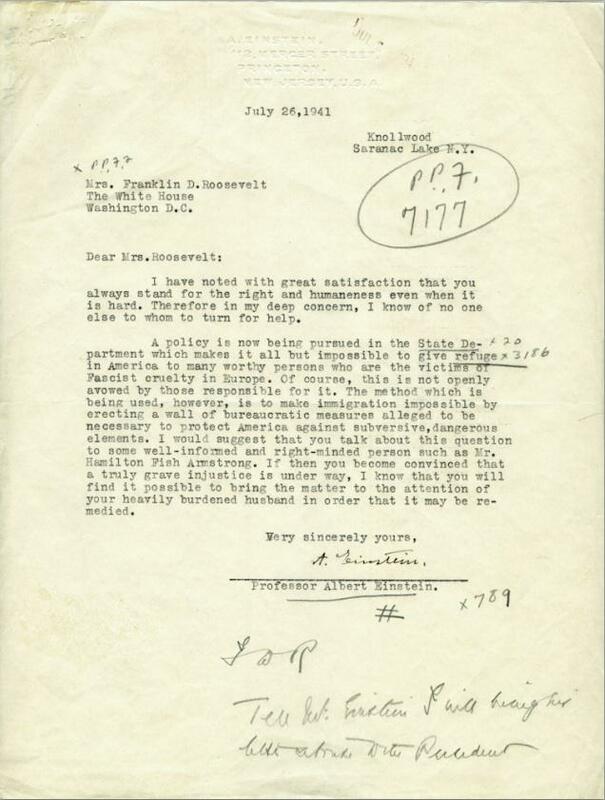 This letter shows that Einstein also lobbied on behalf of the larger group of refugees, leveraging his public profile to ask the Roosevelts to work harder to overcome red tape and quotas that impeded emigration. Eleanor Roosevelt wrote on the bottom of this letter that she would bring the matter to FDR’s attention. Facing political pressure, and fearing that emigration would introduce spies into the United States, the president had recently failed to act on a few measures to increase quotas for specific populations. The letter doesn’t appear to have had any effect on his approach. Einstein had written a famous letter (PDF) to FDR in August, 1939, that was more successful. That missive warned of advancements that would make nuclear chain reactions possible, and urged American governmental investment in the scientific community working on the problem. FDR listened; the Manhattan Project was born. The FDR Library has recently launched new, fun-to-browse digital collections, where I found this letter. Albert Einstein to Eleanor Roosevelt, July 26, 1941.